Somehow it just warms my heart to see thousands of city bikes lined up in endless rows. That requires about as much space as a supermarket or a small office building. Sometimes I wonder how big a parking facility for that many cars would be. I suppose the answer is that it would look rather like the vast sea of asphalt and cars that surrounds a big shopping mall: Occasionally full but usually mostly empty blackness… what a waste of space. 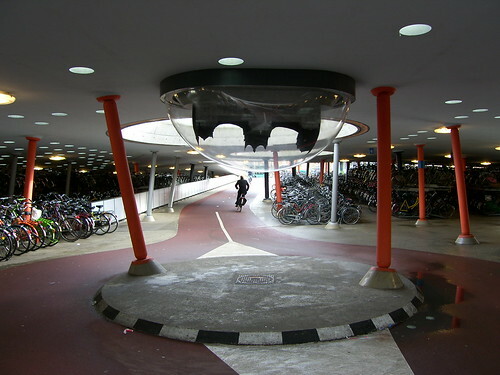 A Dutch bike parking facility, on the other hand, tends to remain remarkably full. Only after business hours does it thin out considerably. 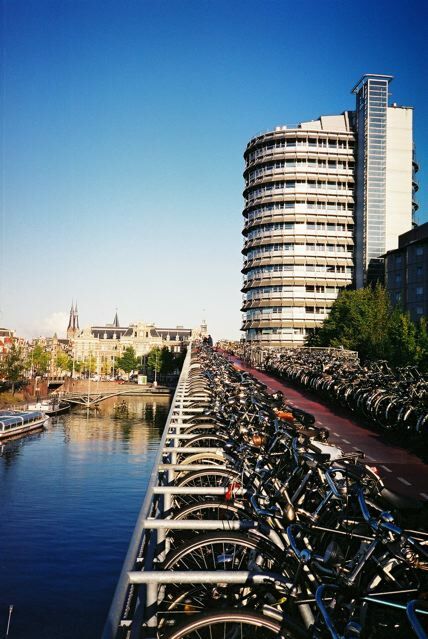 When I used to park my bike daily at the Amsterdam Fietsflat I almost always ended up walking all the way up to the upper level since I came in toward the end of the “rush hour”. The lowest level was perpetually crammed with crappy student bikes, often two or three per “official” space. Of course there’s bike parking all over the city but most of the really big units are at train stations since lots of people ride their bikes to take a train to another town. That might be to “commute” to a job in another town, but it’s often also students who move back and forth between the university in one town and “home-home” in another. 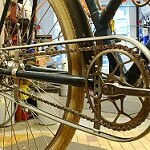 They might even keep an old bike at each end. I suppose one could say that this is a misuse of public space, but it could be easily argued that it’s really very, very little space. Any other means of transport also requires some use of public space and resources as well. 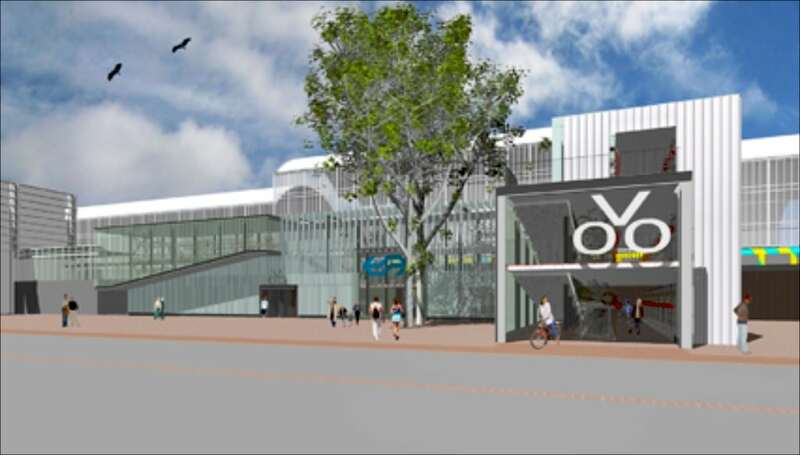 I couldn’t find any pictures of the brand new Haarlem station fietsenstalling so this artist’s rendering will have to do for now. 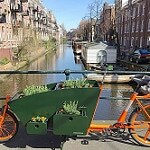 This morning I read in the Fietsberaad Newsbrief that a new that the city of Haarlem has just opened a new fietsenstalling (“fietsen” = “bikes”, “stalling” = “parking”, as in stalls for horses). With spaces for 5050 bikes they claim it to be the biggest in Europe. Certainly it is bigger than the famous and constantly photographed “Fietsflat” by Amsterdam Central Station, which somehow typically holds about 4000 bikes in 2500 spaces. But the “biggest in Europe” might be a bit of hyperbole since there’s already at least one other fietsenstalling with about 5000 spaces: the Stadsbalkon in Groningen. But I’d be surprised to hear about any other facilities in the western world (but outside Holland) that even approach these numbers. Ironically, both of these new facilities will probably operate at capacity within a couple years since, like auto traffic, the demand seems to follow the supply. And the parts and accessories will be added in the coming days and weeks. 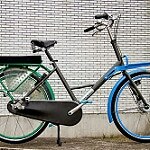 Expect to see: lights, panniers, tires, saddles, locks, child seats and plenty of random but perfectly usable components. 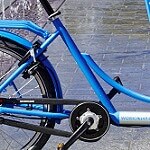 This entry was posted on Wednesday, January 5th, 2011 at 18:00	and is filed under Bicycle parking and storage, Bike Friendly Cities, Bikes in use. You can follow any responses to this entry through the RSS 2.0 feed.You can skip to the end and leave a response. Pinging is currently not allowed. The Haarlem ‘biggest in Europe’ stat refers to indoor, guarded parking. The capacity of the guarded parking at Groningen’s station is estimated at 2700, for example. I think there might be stations with more guarded parking spaces than Haarlem, but they’re spread out over multiple facilities (some towns have a facility on each side of the station, or one run by NS and one by the city). dang, I wish I could take advantage of those deals, but I’m not in Amsterdam. Any news on getting a distributor in Paris? 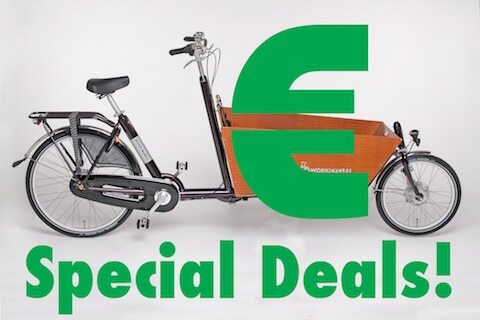 There’s only 1 place I know of that has bakfiets.nl, the rest sell Cabbies and the Christiania range (which I think includes a 2-wheeler, but I’ve never really heard anything about it). b2z, Thanks for the clarification. 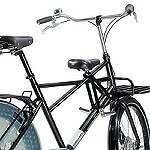 In that case Amsterdam CS must also have more than 5000 spaces between the Fietsflat, the two MacBike run fietsenstallingen, the fietspont and the area near the taxistand. Geen bezwaar tegen de relevante reklame, maar mischien handiger voor onze engelstalige lezers als je hier in het engels schrijft. 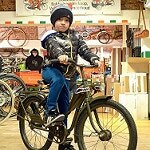 Sébastien of Les Velos Parisiens and his family came to visit us in Amsterdam just before the holidays and I visited the shop in the summer. I was there for several hours. 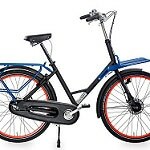 Their shop looks great and I really liked their manner with customers; It was very clear that they know their business, love cycling and take their customer’s needs seriously. I’m happy to hear you confirm my impression. Here in Uppsala, the numbers of parking lots are not so much lower. 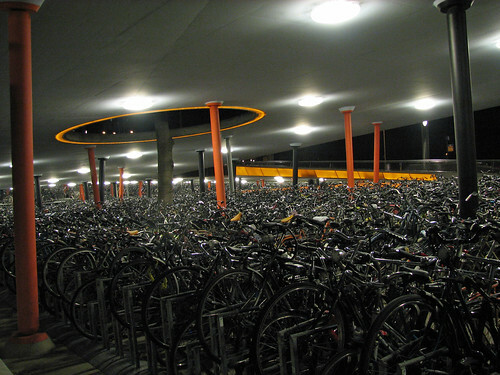 In combination with the reshaping of the main train station, about 4000 outdoor bicycle parking spaces were set up. Currently it is in the discussion to build additionally a bicycle garage with 1000 spaces and a service station. And these numbers are still not sufficient, as almost always all bicycle spaces are in use. So if you want to see a lot of bicycles gathered together, a trip to Sweden could be an idea. 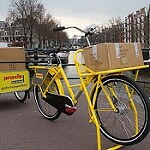 Thomas, Thanks, I’d love to see some heart-warming pics of huge bike parking facilities outside of the Netherlands. After all we shouldn’t bask in any undeserved glory! Uppsala is probably a university city? Eh, I got veto’d on the purchase :/ but eventually (new house, kids maybe) we’ll get one. if i can order through the Vélos Parisiens I’ll do that! The biggest one I know here in Germany is – who expect anything else – in Münster, the german bike capital, it has 3.300 parking spaces and it is, too, near to Grand Central Station (http://de.wikipedia.org/wiki/Radstation_Münster). The german word “Fahrradparkhaus” should give you many more hits in google. Btw. it’s such a shame Hamburg being 2011s “European Green Capital” and to see what they did (or better NOT did) to improve the bike experience, so being several times bigger than Münster there is no real bike parking facility at all here in Hamburg! You can be happy if you’ve such facilities for parking. You rarly find something with a roof on top in Vienna. the facade on this picture (on the backside of the station) is not finished yet – to be honest, this is not really a spectacular bike parking, but it is huge indeed. It opened less than two weeks ago so there’s still a lot of space. Don’t worry, it’ll fill up soon enough. Bicycle parking in near the railway station in Leuven (Belgium) has room for 4000 fietsen. Leuvense fietsers are not to happy with this parking. It is new, and your bike is inside, and there is some surveilance. Nice, but is a long small building an so it is a long way from the outerend to the station entrance. And it is to small ! Fietsersbond Leuven (yes, we have that also) always asked for 10000 spaces. Because railway traffic is going to boom in the next twenty years. The city of Leuven and the railway company refused to see this and now after only two or three years it is almost full. The latter one giving a nice view on what is happening (or not) in cycling Leuven. Thanks everybody who’ve noted the bigger bike parking areas and provided photos and video of the new Haarlem fietsenstalling. I suppose a relevant question is whether cities will build continually bigger bike parking areas at train stations as steadily more travelers choose to cycle to the train. On the one hand it might very well be the cheapest and most feasible way to enable travelers to reach the station, and enormous numbers of bikes can be parked in relatively small volumes. But such politics don’t generally work so logically and perhaps some really dumb “enough is enough!” decisions will be made in a few years. Hm, considering that every single bike at a station is a paying non-polluting passenger, it would be a dumb decision indeed. Although at stations with crazy levels of (cycling) demand, I suspect that some feeder bus/tram lines could be improved too, to absorb some of that demand earlier. As I noted above, city bureaucrats and politicians don’t always make the most practical and logical decisions. Within the decade we’ll see what happens when at some of these stations 10,000 or even 20,000 bike parking spaces are continually filled and it becomes more difficult to find the real estate for more. That’s the other side of the railway. Those racks have been moved a couple of months ago. And will eventually be placed in the smaller parkingspace I mentioned in my previous post. In the master plan of the Leuven railwaystation area, the bicycleparking was planned under the square in front of the station. Perfect ! Underneath the square they installed a carparking. Not for people who want to take the train, its far to expensive to leave your car there every day of the week, but for people shopping in the city center. It looks like this : http://edflex.blogspot.com/2010/11/kathedraal.html . What you see is only the upper floor. 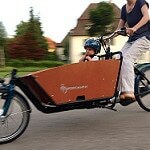 The last picture gives is a suggestion to create an extra floor for storing bicycles. the parking in Groningen is almost always full. There are attendants who will tell you where openings are, but sometimes you are waiting a few minutes for someone to leave. There is parking across the street along the canal and several other places around the station, but this one in Groningen is very nice for the double stacked racks and dry conditions. 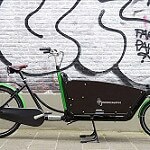 Two days ago, Dutch newspaper NRC Handelsblad had an article on bike parking congestion. 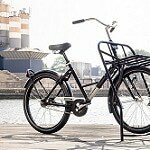 It seems that Amsterdam in particular is brooding on introducing paid parking for bikes so as to keep the problem manageable – although for the life of me I cannot see how this could either be realised or have any effect. I’ll send a pdf of this article to your email address. Utrecht seems to have resorted to planning all parking in the renewed station area (see Utrecht’s Notitie Fietsparkeren Stationsgebied) to be paid to the tune of €0.50 a day. The council figure that’s the only way to be able to afford the whole scheme, and to reduce the number of bikes parked in the area – they expect they’ll need as much as 22,000 spaces despite the new paid-only scheme. I wish them the best of luck, with no free parking there’ll be bikes scattered all over the station area and far outside it. What’s wrong with making the first day free and charging money for any subsequent day? 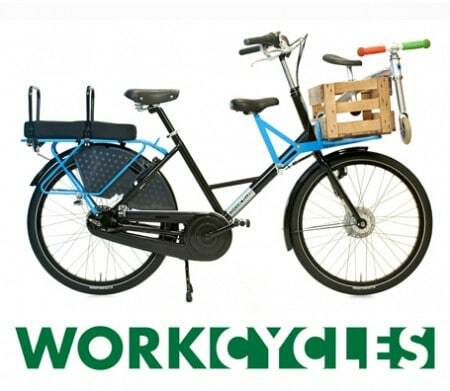 Seems to work well enough where it’s been implemented… it stops people like me from dumping a cheap bike in free guarded parking in Utrecht and Amsterdam just in case we need one, while still offering free parking to local commuters. Hmmm, paid bike parking. I think Amsterdam CS is already one example of how few people are willing to pay to safely and conveniently park their bike. These days I ride prototype bikes with child seats and crates and tend to take trains at off-peak hours after the Fietsflat is full. 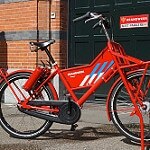 So I generally park my bike at the MacBike fietsenstalling on the west side of the station. It’s convenient and costs about €1,50 for the day. 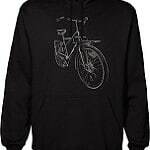 But there are never more than perhaps a 100 or so bikes there, at least on the non-subscription side. Meanwhile some ten thousand bikes are jammed into every other free parking facility around the station. I can only imagine that paid bike parking could be effective at stations and other destinations where space is clearly limited and bikes will typically be parked for the better part of a day. And then it’ll have to be cheap. I have no problem with €0,50/day but I agree that making the first day free and then charging for subsequent days makes more sense for stimulating bike use… though even this might lead to more bikes being abandoned since people will just leave any bike that costs too much to retrieve. If you poke through the Utrecht document a bit more you’ll find that they estimate a demand of 33,000 for the long term, and yet they use the figure of 22,000 spaces for the rest of the document. Either they’re not planning for the long term, or they’re expecting to reduce the number of spaces by ⅓ by forcing paid parking on everyone. Given that the station rebuilding project has “2030” in the name, I’m guessing they’ve got the long-term thinking bit covered… draw your own conclusions on what paid parking will do to the demand. As there is an ongoing reconstruction of the train station area, the situation is a little bit chaotic. And yes, Uppsala is a university city. However, a lot of people also use bikes, who will then use the train to commute to Stockholm. Pilot at the Stadsbalkon in Groningen. A sign showing where in this parking there is a free space. 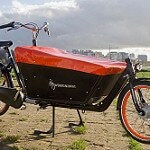 https://www.rtvnoord.nl/nieuws/nieuws.asp?pid=101946 (site of the local radio, didn’t see it myself yet).